Johns Hopkins University researchers have caused stem cells from adult goats to grow into tissue that resembles cartilage, a key step toward creating a minimally invasive procedure that may one day be used to repair injured knees, noses and other body parts. In this method, doctors would inject a fluid filled with stem cells and nutrients into damaged tissue, then use light to harden the liquid into a stable gel. Although human testing remains years away, the researchers believe stem cells within the gel will multiply and form new bone or cartilage to replace the injured tissue. Paving the way for this technique, the researchers have conducted lab experiments that turned stem cells within a gel into cartilage-like tissue. The team expects to begin testing the process on mice this fall, says Jennifer Elisseeff, assistant professor in the Department of Biomedical Engineering. 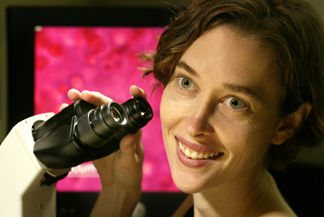 Elisseeff is leading a multi-disciplinary tissue engineering team that includes a plastic surgeon, an orthopedic surgeon, a polymer chemist and graduate students, all affiliated with the Whitaker Biomedical Engineering Institute at Johns Hopkins. 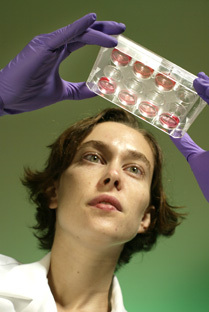 Jennifer Elisseeff examines laboratory vials containing adult stem cells, encapsulated in hydrogel and surrounded by an orange-colored culture medium. Like many new research projects, this work uses stem cells because they have the ability to renew themselves and also to develop into many types of tissue. Elisseeff�s lab is using adult multipotent cells, meaning they can be stimulated to produce different types of musculoskeletal tissue. Ethical debates surrounding stem cell research have focused on material removed from human embryos and fetuses, not the adult cells used in Elisseeff�s experiments. Adult cells offer another advantage: In theory, patients preparing for cartilage or bone repairs will be able to donate their own stem cells prior to the procedure, reducing the likelihood of infection and tissue rejection. MIT�s Technology Review magazine recently recognized Elisseeff, 28, as one of the World's Top 100 Young Innovators in technology and business. Her current project, funded by the Arthritis Foundation, builds on work she began as a graduate student in the Harvard University-MIT Division of Health Sciences and Technology. Elisseeff was lead researcher in developing a polymer fluid�laced with cartilage cells called chondrocytes � that can be injected under the skin. The liquid is then hardened by shining an ultraviolet light or visible laser through the skin. 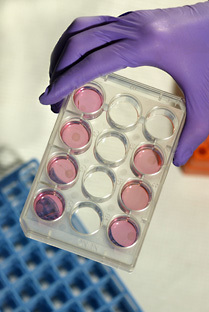 The solid material,called a hydrogel, forms a scaffold or framework upon which cells can reproduce and form new tissue. MIT's Technology Review magazine recently recognized Jennifer Elisseeff, assistant professor of biomedical engineering at Johns Hopkins, as one of the World's Top 100 Young Innovators in technology and business. Now, in a new lab at Johns Hopkins, Elisseeff and her colleagues are placing stem cells in her hydrogels and coaxing them to produce cartilage and an early form of bone within the polymer framework. Recently, Christopher Williams, a plastic surgery fellow in the lab, has conducted experiments with stem cells derived from the bone marrow of adult goats. By surrounding these cells with a specific growth factor that helps direct cellular differentiation, Williams has prodded the stem cells into forming what lab tests indicate are osteoblasts (cells that develop into bone) or chondrocytes. The cartilage samples show the proper gene expression and a cartilage-specific extracellular matrix. Lab tests show that the bone precursor cells are producing calcium, a first step toward osteogenesis, the formation of bone. Researchers believe their experiments with adult stem cells will lead to a new, minimally invasive method of treating injured joints. Elisseeff�s team is now fine-tuning the technique. The researchers are synthesizing a new hydrogel that should degrade harmlessly in the body after the new tissue develops. Also, the team is refining its cell growth methods to more closely mimic the normal development of cartilage and bone cells. Elisseeff and her colleagues have submitted some of their lab results to a peer-reviewed journal.